It’s a glorious time! A neighborhood gem is open for business and happy days are here. Every summer, Spooner Farms sets up a stand nearby and we take almost daily walks to it. We gobble their beautiful berries by the flat! 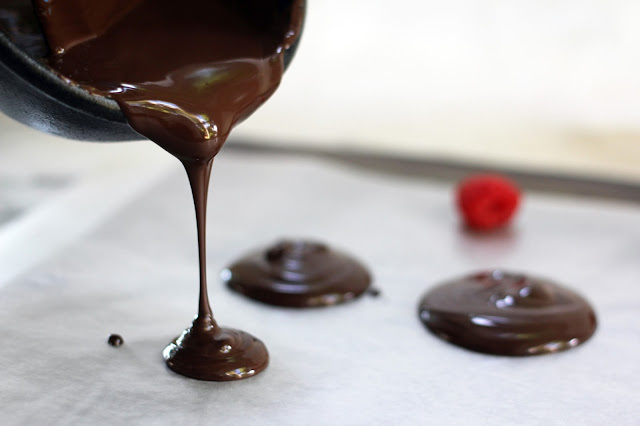 And sometimes I am able to set aside a few pints to make these simple treats – Raspberry Chocolate Puddles. While in college together, Bob and I worked at Rocky Mountain Chocolate Factory. It was such a fun student job and I nibbled way more chocolate than I care to remember now! We made chocolate truffles, caramel apples rolled in nuts, tiger butter and divinity fudge, and we dipped countless pretzels, strawberries, graham crackers and Oreos in chocolate. Racks of all the confections made in the shop were displayed for passers-by on the sidewalk to drool over. One of the most appealing creations in the window, though, were the delicate puddles of chocolate with fresh raspberries dotting them. So festive and pretty! 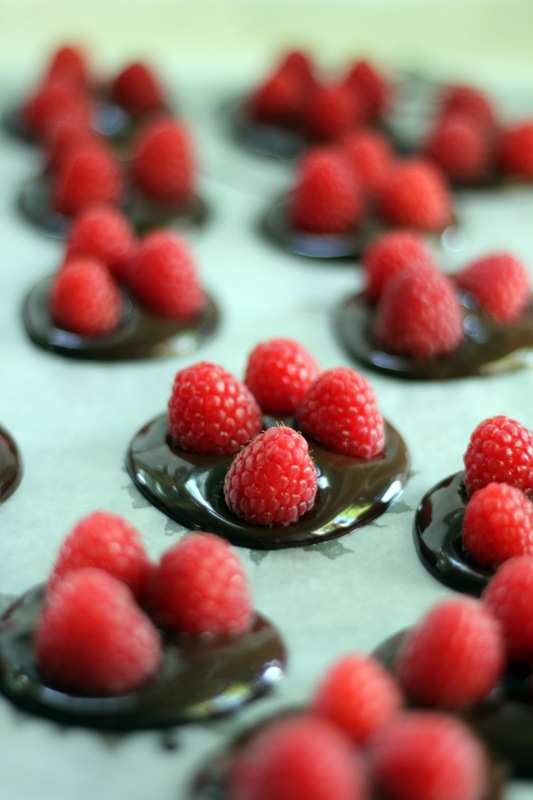 While working in the shop, I loved putting on music and losing myself in making Raspberry Chocolate Puddles. Stirring the melted chocolate and pouring out little pools, picking out raspberries and carefully arranging them on top ... this was all a wonderful break from classes and studying. Of course, there were some puddles that were not quite display-worthy, so I also had the (awesome) responsibility of taking them home to eat and share with friends. 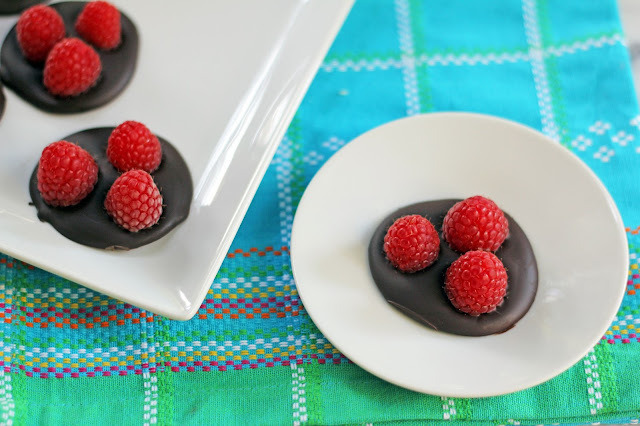 These days, I still love to melt chocolate and celebrate raspberry season with these quick, delightful treats! Line a baking sheet with parchment paper. 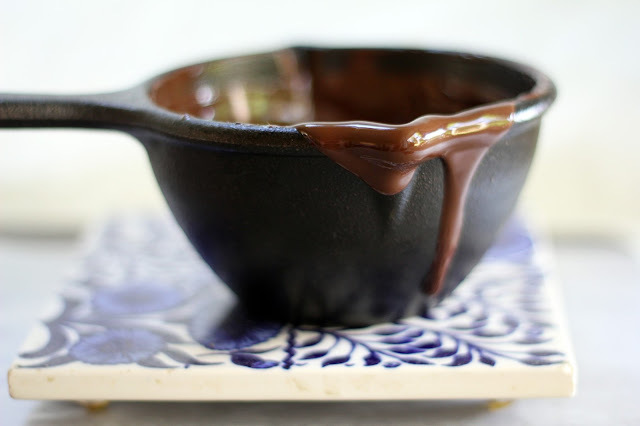 In a small sauce pan, gently melt the chocolate over low heat, stirring often and removing it from the heat as soon as it’s mostly melted. Continue stirring off-heat until smooth. Pour small puddles of chocolate onto the prepared baking sheet. Place 3 or 4 berries on each chocolate puddle. You may have a few berries leftover to nibble on. Let the chocolates harden at room temperature in a cool area or in the fridge for about an hour, or until they easily lift from the parchment paper. Store the treats in a single layer in the fridge. I have to check out this berry stand Hannah - you are lucky to be in walking distance! I think you'll love the berries, Alyssa! Definitely stop by in the morning as they are often sold out by noon. I wanted to bring you some this afternoon and they were already closed when I went by! Raspberries and blackberries are there now. How simple and yummy! Love it. You worked in a candy store? - that's awesome! Rocky Mountain Chocolate Factory? Really? Small world. I love that seafoam stuff; working on a post for that now (or at least my version). These are wonderful bites; two flavors I just adore together. Oh wow, seafoam is wonderful! I can't wait to see your yummy version. It really is a small world, isn't it? Love the subject line!! You are awesome, thank you. 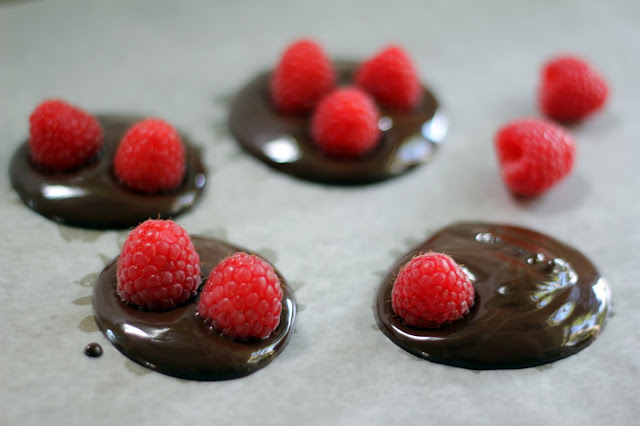 Oh wow, a puddle of chocolate and raspberries, I can't think of anything more delicious. Those berries look perfect. What a great farm stand you have in the nabe. Lucky!!! Summer berries really are glorious, and to have them within walking distance is such a treat. And adding chocolate just makes everything better! What a fun memory! I worked at a sandwich shop in college and love busting out my sandwich making skills to this day. My only regret is that I can't slice the meat myself! When I've been to Rocky Mountain, my eyes are only on the most loaded of the caramel apples...the worms in dirt one was my weakness. These are such a simple and sweet treat. Yum! I love these! Great way to combine healthy berries with chocolate - what could be better? ;-) Really nice, though - thanks. These are utterly spectacular!! Wow, wow, wow, wow, wow. I'll be over in five minutes. Thanks, Sue! 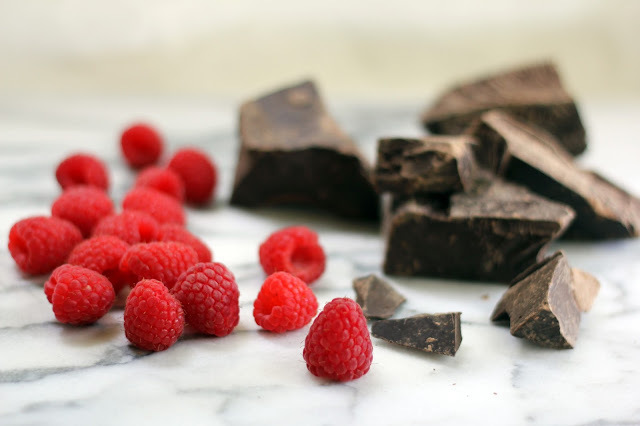 Chocolate is certainly a wonderful way to showcase these beautiful berries. It's a glorious season! These are so pretty! They look wonderful! what a glorious [and pretty] idea. Will have to try - yum. Thank you so much, Hungry Mum! The puddles are quite simple, yet so good. I was just eyeing your flourless chocolate cake...I'm putting it on my list to try soon. I'm happy you stopped by and hope you have a wonderful weekend!